For the next few weeks things are going to be a bit wacky around here. Yesterday morning this was our kitchen. By the evening the cabinets and appliances were out, the floor was gone and the ceiling was raised. Tomorrow this wall comes down so we let Halley have a little sharpie party. This may or may not come back to to bite us. But she was in paradise. Today a gorgeous trench was dug. This is so exciting, so dusty, so noisy, so stressful, but I am so happy. Each step makes me giddy. Plus tomorrow I hope to fulfill a lifelong dream. To smash a wall with a sledgehammer. Hopefully our contractor will indulge me. HOLY COW!!! i love construction projects. so. much. We are redoing part of our kitchen too, and right now, we are without a sink...it's very stressful with two kids, but trying to think of how pretty it will look! ooooh! have fun! 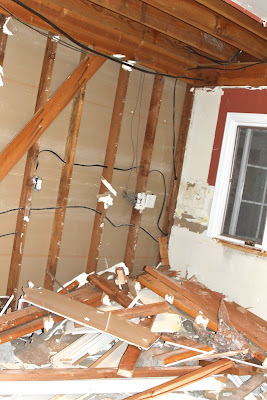 I got to smash a closet when we redid the bathroom--was it ever fun! Eeek - and here I am going crazy in my kitchen (yesterday was demo day here, too!). It's going to amazing, I know it! How exciting!! What fun to photograph the whole process. Can't wait to see the beautiful new space! 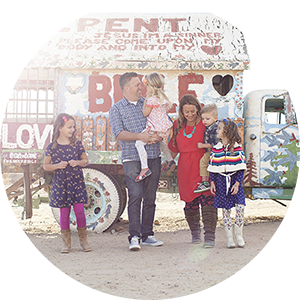 If I haven't commented before, then I'm delurking :) We went through a big remodel almost 2 years ago-totally get the crazy, dusty...with a 2 year old at the time and a newborn, we lived in crazy, dusty, not so awesome, plastic ET wall and all. The final product was SO worth it! When people told us if our marriage can survive a remodel, we can survive anything, I didn't have a clue. I get it now, and am happy to say we're back to the awesome. Best wishes! Love it! Kitchen makeovers are the most satisfying projects. Ever. Oh fun! We finally did a kitchen/family room renovation this fall. It was a mess, but so worth it! It will be soooo worth it. I did it a few years back and that gas line was the worst part, but you will love it. I really can't wait to see the finished product! OMG I think I just broke out in hives. Wowza! That is some major demolition going down! I can't wait to see the finished product!!! wow! can't wait to see the "after" pics! and am totally jealous about the gas line... electric drives me crazy! Wow!! Now that is a major undertaking. But, every exciting. I cannot wait to see what you are going to do with that kitchen. I can only imagine it will be FABULOUS! Wow. I am speechless. "Speechlessly" excited for you? We have some redecorating we are doing...but nothing like your redo! Good luck! oh man!! lucky girl!!! i can't wait to see the progress! sometimes there is such a thing as "good dust"
YAY a gas line!! i too had electric in the first house we purchased and it was a pain in the ---. i was over the moon when we purchased our second home and it had a gas range. oh how i love to cook!!! I am so jealous!!! Our remodeling is so small scale, I would love to knock down walls. Enjoy it! love it...can't wait to see you! Wow. Can't wait to see the finished product. Hope it doesn't take too long! My goodness - hope you are still this calm further into the reno. Can't wait to see the final look. Oh wow! How long do you expect this to take? When I had my kitchen done (after years of saving up!) I couldn't face living with the dust, so we went on holiday and let the guys get on with it! I'm very curious to see your 'before and after' shots in the future! oooh! FUN! FUN! I'm about to join you my friend!- only building from the ground up! Have a happy sledge-hammering day! Congrats! I want a new kitchen too! I will have to settle admiring yours!! XO Miss you. Any survival tips are greatly appreciated! Are you LIVING in this house?? wow, you are one cool mom! is it sad that renos get my heart racing? this is like my mommy crack! can't wait for 'afters'. How perfect was the timing on Meg's "kitchen remodel" post? So... lots of Chick Fil A right now? HOW FUN. oh my goodness. the joy you will have when it is complete. love products with a dramatic change. hang in there. i know the weather is a little crazy. Oh how exciting!!! I love living through others remodels :) SO MUCH FUN! I can't wait to see the progress! i LOVE that picture of her drawing on the wall!! Oh my gosh ~ good luck! ooo! I'm a little jealous! I've wanted a kitchen makeover since we moved here two and a half years ago!